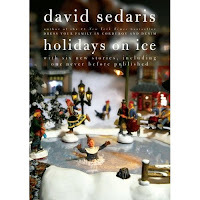 If the very thought of Christmas makes you want to run screaming for a wig or yarmulke, consider including David Sedaris's new and updated Holidays On Ice in your disguise kit. It's light, portable, and easy to hide beneath a tallis or foot-long beard. And now with six additional holiday-themed stories, including one never before published, it is the ideal companion with which to pass long hours besides the menorah. Even if you take it straight-up Christian, if you choose to spend the holidays glazing hams, say, or baking cookies shaped like hobos, you will find this book indispensable. Here is the timeless "SantaLand Diaries," which immortalized the struggle of department store elves the world over. Here is "Dinah the Christmas Whore," in which the Sedaris family opens their hearts to an unexpected, almost Mary Magdalene-like visitor. These and four other favorites are jointed by six new tales detailing the nuances of explaining the Easter Bunny to the French ("Jesus Shaves"), what Halloween looks like at the medical examiner's office ("The Monster Mash"), the puzzling Christmas traditions of other nations ("Six to Eight Black Men"), and a brand-new story about a barnyard Secret Santa scheme gone awry ("The Cow and the Turkey"). No matter what your favorite holiday, you won't want to miss celebrating year-round with the writer Entertainment Weekly has called "the preeminent humorist of his generation." I read the original version of this collection a few years ago and really enjoyed it so I jumped at the chance of reading the stories again and the new additional stories! The new stories are definitely a welcome addition! Of the original stories, The SantaLand Diaries starts the collection off on a hilarious note. You get to read bout the inner workings of being a department store Christmas elf. The crazy santas, elves and customers! Season's Greetings to Our Friends and Family!!! starts off innocently enough as a family holiday letter and quickly takes a turn for the hilariously insane, like a lot of Sedaris's stories. Of the new stories, Jesus Shaves is by far my favorite. It had me crying from laughing so hard. I don't want to give anything away, so just trust me, it's hilarious. Six to Eight Black Men was also hilarious along the same line. Definitely learned things I didn't know about how other countries celebrate to holidays. I wasn't totally fond of The Monster Mash, about a trip to a medical examiner's office, it spoke to my weak stomach and my stomach said no thank you. But it still had it's funny moments. All in all this is a hilarious holiday collection and the new stories are a welcome addition helping add additional holidays to this collection. P.S. Does this cover remind anyone else of Sarah Vowell's covers? I love them! I think I'm the last person to read any of David Sedaris' work. I've got Naked on my wish list because someone suggested I should start with it. I've got this one on my TBR list! Nice review! This sounds like a great book to bring on my Christmas vacation. It wasn't until last year that I got turned on to holiday reads for Christmas. It really does make the holidays more fun! I just got this a week or two ago and haven't taken the plunge yet but can't wait. I've had the older version of the book for several years and just love it. I never tire of listening to Sedaris read his own essays on audiobook. This is waiting on the shelf for me. The covers (Sedaris' and Vowell's) remind me of the claymation of Mr. Bill or Gumby. Wish I could shrink down and explore those worlds. Keri Mikulski- These stories are hilariously crazy, a nice change of pace! bermudaonion- I didn't read anything until I borrowed a book a few years ago from a friend, he's a great writer! I think the first one I read was Me Talk Pretty One Day, I actually haven't read Naked yet! k and/or k- It's great for a laugh for sure! amee- Prepare to laugh uncontrollably! j. kaye- I agree, I'm not sure I ever read many. Maybe Mary Higgins Clark christmas books in junior high but that's all. I have two YA holiday short story collections I'm hoping to read this year! marie-It's so great isn't it! Some of the new stories are great! charley- The first time i listened to one, I was like wow, what! ? He's great! I haven't read any of his books, but I've heard they're funny. I want to read them :-) They sound fun! veens- They are fun and hilarious!